If necessary, press [2nd][MODE] to enter the Home screen. Enter the number you want to store in a variable. You can store the number as an arithmetic expression. This is illustrated in the first picture. After you complete the steps for storing the number, the calculator evaluates that expression. The result of this action is shown in the first picture. Press [ALPHA] and then press the key corresponding to the letter of the variable in which you want to store the number. Press [ENTER] to store the value. This is illustrated in the third picture. when graphing functions, parametric equations, and polar equations, it is possible that the calculator will change the value stored in these variables when the calculator is in graphing mode. For example, if you store a number in the variable X and then ask the calculator to find the zero of the graphed function X2, the calculator will replace the number stored in X with 0, the zero of X2. So avoid storing values in these three variables if you want that value to remain stored in that variable after you have graphed functions, parametric equations, or polar equations. After you have stored a number in a variable, you can insert that number into an arithmetic expression. 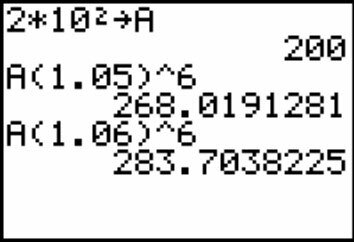 To do so, place the cursor where you want the number to appear, press [ALPHA], and then press the key corresponding to the letter of the variable in which the number is stored.